For the Cornish Saint Hermes, see Erbin of Dumnonia. Dutch Book of Prayers from the mid-15th century. Saint Hermes is the figure in the back, in armour. Other saints pictured include Saint James the Great, Saint Joseph, Saint Ghislain, and Saint Eligius. Saint Hermes, born in Greece, died in Rome as a martyr in 120, is venerated as a saint by the Catholic Church and the Eastern Orthodox Church. His name appears in the Martyrologium Hieronymianum as well as entries in the Depositio Martyrum (354). There was a large basilica over his tomb that was built around 600 by Pope Pelagius I. It was restored by Pope Adrian I. A catacomb in the Salarian Way bears his name. In the Roman Rite, his feast is on 28 August. Under that date, he appears in the Roman Martyrology, the official but professedly incomplete list of saints recognized by the Catholic Church. The entry is as follows: "In the Cemetery of Basilia on the Old Salarian Way, Saint Hermes, Martyr, whom, as reported by Saint Damasus, Greece sent forth, but Rome kept as its citizen when he died for the holy name." His existence is attested by his early cult. However, his Acts, included in those of Pope St. Alexander I, are legendary. They state that Hermes was a martyr with companions in Rome, who were killed at the orders of a judge named Aurelian. Hermes was a wealthy freedman. Church of Saint Hermes (Sint-Hirmes) in Ronse, Belgium. Some of his relics were given to Spoleto by Gregory the Great. 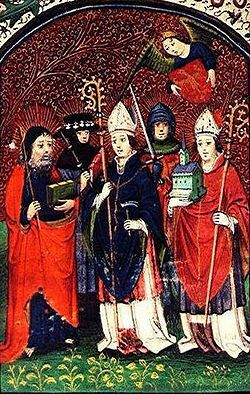 Other relics went to Lothair I by Pope Leo IV; Lothair brought them first to Cornelismünster, near Aachen. The relics later came to Ronse in the 9th century. During those times, Viking raids forced the monks to flee the town more than once, and the monastery was burnt by the Normans in 880. The relics were recovered in 940 and housed in a Romanesque-style crypt in 1083. The church of Saint Hermes, which was later built on top of the crypt, was consecrated in 1129. A pilgrimage in honour of the saint, who had by then be known to cure mental illnesses, sustained the local economy. There is still a French saying today which translates as "Saint Hermes cures the area's madmen but keeps the Ronse dwellers as they are". Although he is recognized as a saint of the Catholic Church, the commemoration of Saint Hermes in the General Roman Calendar was removed in 1969 because of the paucity of information about him. ^ David Farmer, The Oxford Dictionary of Saints (Oxford: Oxford University Press, 1978), 191. ^ Martyrologium Romanum (Libreria Editrice Vaticana, 2001, ISBN 88-209-7210-7). ^ St. Hermes at Catholic Online. ^ Calendarium Romanum (Libreria Edictrice Vaticana, 1969), p. 136. This page was last edited on 28 June 2018, at 01:03 (UTC).